The term “organic” is easily understood when it comes to fruits, grains and vegetables, but what does “organic” really mean when applied to fabrics and textiles? Not all organic cotton sheets are the same, conventional cotton growers have historically relied on a liberal dose of synthetic pesticides, fertilizers and harmful chemicals, making cotton production second only to corn farming in the amount of hazardous pesticides used worldwide. 25% of international pesticide usage can be traced to non-organic cotton farming. Organic cotton growing was developed in an effort to reduce and eliminate the negative impact of these highly dangerous chemicals on our soil, water and health. But how do you know how organic your cotton bedding really is once the cotton leaves the soil? Organic cotton farmers utilize natural fertilizers and beneficial insects to safeguard their crops and replenish and maintain soil fertility and biological diversity. After cotton is harvested, however, it undergoes several processes in manufacturing that may or may not be conducted in an entirely chemical-free or hypoallergenic environment. Cotton textiles labeled as organic or natural may nonetheless be produced using an array of toxic and carcinogenic chemicals including formaldehyde, arsenic, and heavy-metal dyes. Some companies that label their cotton products as organic, may in fact be using only a small percentage of organic cotton blended with non-organic cotton (or another fiber) and/or processing their textiles using hazardous materials. Currently, there is no applicable standard that can be applied internationally to organic products, and standards are applied according to individual markets. There are, however, a few third-party certification organizations that have been established to verify that organic cotton manufacturers and growers are employing fair trade standards, and utilizing only materials and methods that are permitted in organic production. The Global Organic Textile Standards working group (GOTS) The Global Organic Textile Standard (GOTS) is recognized as the world’s leading processing standard for textiles made from organic fibres. It defines high-level environmental criteria, along the entire organic textiles supply chain, and requires compliance with social criteria as well. Until standards become universal, consumers are advised to read labels carefully, to call companies to ask questions, and to see how knowledgeable they are about certified organic. OBS advises to buy only from retailers that you are able to speak to, and feel comfortable with. 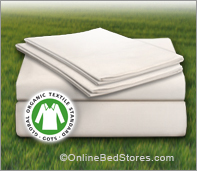 It is advisable to stay away from large retailers that offer very low pricing on organic bedding. Bedding is only truly organic when it is “certified” by a third party such as (GOTS) The Global Organic Textile Standard. Only buy “Certified Organic” to insure that the sheets, pillowcases and bedding that come in contact with your skin, are truly organic and free from the chemicals you are to avoid.